A quickly changing market is one of the biggest challenges, companies are facing nowadays. In order to adapt to new conditions big players but also smaller enterprises use the concept of ‘process automation’ that comes with a lot of advantages. The global process automation market is poised to grow at a Compound Annual Growth Rate (CAGR) of around 9.1 per cent over the next decade to reach approximately 210.84 billion dollars by 2025, according to a research report. Process automation makes use of computer technology and software engineering to help numerous industries operate more efficiently and safely. In the manufacturing industry, the concept of ‘process automation’ is known for easing the workflow process. Be it compiling and processing all the vital data or making use of a system that detects errors in the production process and also mentions its cause; all of this comes under the blanket of process automation. Today, manufacturing companies are making use of this concept to streamline their operations, boost productivity, and adapt quickly to the changing market. There is a growing demand to adopt solutions for digital workflows at the shop floor. Process automation is the next phase of industrial modernization wherein employees can monitor and resolve machine faults and maintenance just by viewing their phones. It also helps to reduce costs by changing traditional manual processes with new, improved and accurate solutions. It defines a consistent workflow process and eliminates redundancy and at the same time, improves accountability and enforces business rules and standards. For instance, DMG Mori recently introduced an extensive portfolio of data-based digitization modules for production planning and tool management, among other applications. The solutions are expected to connect and also lead small and medium-sized enterprises (SMEs) in particular to the future of the digitized industry. In addition to this, to shorten decision-making processes and make it possible to perform even unfamiliar tasks faster and more flexibly in production operations, Fraunhofer IPT and Mitsubishi Electric have come together and developed a new system that compiles and processes all the key information for machine operators on mobile devices. 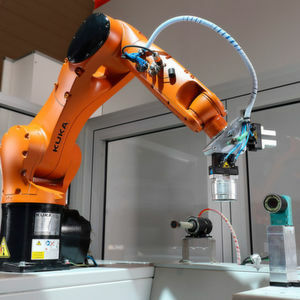 Hermle has also launched a robot system that can be adapted to supply three machining centers with workpiece blanks or pallets. This system will further boost the machine running times in fields such as medical technology, precision mechanics and electrode manufacturing. According to a report by Industry ARC, a research and consulting company, the region of Americas dominates the market revenue of the process automation market followed by Europe, Asian-Pacific (APAC) and the rest of the world (RoW). The industry is slowly but steadily moving towards the Industry 4.0 concept and every effort should be made for the growth of related segments such as process automation so that it contributes to the future of manufacturing and establishes new avenues for growth!